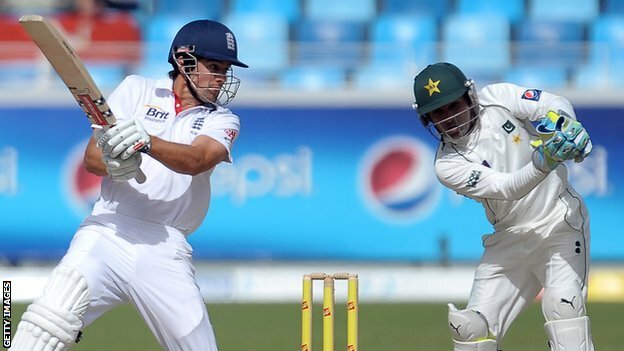 England came up against Pakistan, who due to tragic events beyond their control, were left on the fringes of the sport, having to play their "home" matches in the UAE. They also weren't the most welcome visitors to other nations - exacerbated by the spot-fixing scandal when England hosted Pakistan in 2010. It became quickly apparent that while England arrived for the series in confident mood, it was the dangerous brand of confidence that ferments complacency, rather than drive. England were proverbially backhanded by Pakistan, as a combination of shoddy batting, and brilliant spin bowling by Saeed Ajmal and Abdur Rehman gave the hosts a 3-0 whitewash series victory. For 2012, read 2015. They're not the world's highest ranked team, but after another Ashes win, England head to the UAE to face Pakistan again, with the 1st Test beginning on Tuesday. One would hope this England side don't approach the series in the same slapdash manner as they did 3 and a half years ago. But make no mistake, they're in for another backhanding if they do. Pakistan are to be taken very seriously. Despite having plenty of warranted excuses for mediocre performances, Pakistan are arguably cricket's greatest overachievers at present. Since being consigned to the UAE, Pakistan have played nine Test series, and are yet to lose any of them. And while Ajmal and Rehman are no longer a factor, Pakistan have more than adequately replaced them with Yasir Shah. The leg spinner has had a stunning start to Test cricket, becoming the fastest man to reach 50 Test wickets for Pakistan. And this from a nation who has given us bowlers like Wasim Akram, Waqar Younis, Sarfraz Nawaz, Imran Khan, and Mushtaq Ahmed. Going from their home conditions to the environs of the UAE requires a considerable transition for England, something which they failed to do in 2012. One fears that their recent penchant for aggressive batting will be ill-suited to the slow, dusty pitches, and broiling temperatures they will encounter over the next few weeks. This is a relatively young team, and it will be extremely foolish to assume they can transplant the style of the play that regained the Ashes to the challenge of beating Pakistan. If England can learn to adapt to such unfavourable conditions, it could be a pivotal part in their development, especially with an away series against South Africa to come at the end of the year. But let's be clear, Pakistan will be favourites to beat England again. Don't be shocked if they do. "We are right on the edge of a shopping centre [Westfield in Stratford] so we are very hopeful that that's going to increase the female fan base." This statement concerned West Ham attempting to broaden their fanbase. An understandable aim, but the problem is the gender stereotyping, as well as assuming that the only thing that's been holding women back from going to West Ham games is proximity. Similar imbecilic thinking has also been at play in the NFL, who think the best way to get women interested in the sport is the revelatory idea of... pink. Yeah. that's about it. If Gold, if West Ham, if male-dominated sports really care about welcoming women, they could start by catering to the women fans they already have - of which there are more than received wisdom acknowledges. It's a sexist myth that women need to be pandered to like toddlers. Rather than shopping centres, or pink merchandise, how about ensuring greater links between your men's and women's teams (assuming they even have a women's team), take a no tolerance policy on sexist chanting, or eschew picking players who have been linked with committing violence against women. Of course, to do that would mean actually caring about women. But I suspect it's another "W" that Gold cares about. It's a slang term sometimes heard around West Ham's neck of the woods. One visible on the front of the shirts of another Premier League club. - Although they will return to tour England next summer. - Or for those who've seen the Chris Rock film, Head of State, Pakistan were basically the Bernie Mac character. Because it can never be said enough, R.I.P Bernie. - His potential duel with Joe Root has the potential to become one of the most compelling cricketing contests of the year.